The annual Stick it to Cancer hockey tournament, set for April 12-14 at the Schwan Super Rink at the National Sports Center, will draw both youth and adult female teams to play for a championship, but more importantly, to raise funds to fight breast cancer. Last year's Stick-it to Cancer tournament raised $61,009 to make this donation to the University of Minnesota Masonic Cancer Center. Over the two decades the tournament has been held and a total of $870,732 has been donated to breast cancer research. 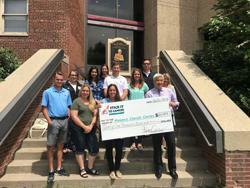 For most of those years, the beneficiary has been the Masonic Cancer Center at the University of Minnesota, and this year’s donation will go to the same organization. Last year’s donation total was $61,009. Everyone can join the donation team. Click here to make an easy online donation on the Stick-it website. And then come out April 12-14 and watch some great players skating for a cause.